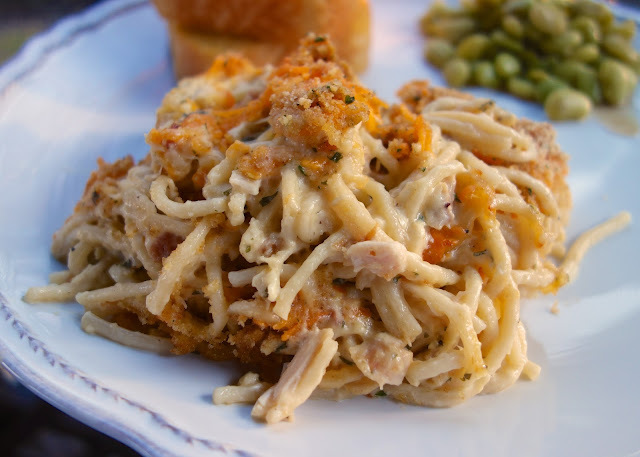 Cheesy Chicken Spaghetti Casserole - chicken, spaghetti, cream of chicken soup, sour cream, butter, seasonings, Parmesan and cheddar cheese -THE BEST! We make this once a month! Makes a great freezer meal! This recipe is from Plain Chicken reader, Jennifer Colson. She calls the recipe chicken tetrazzini. 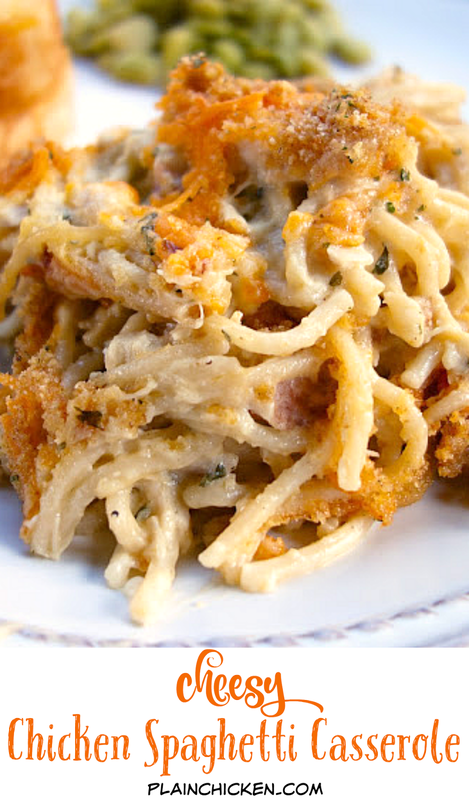 I already have a couple of tetrazzini recipes, so I call this Cheesy Chicken Spaghetti Casserole. We thought this was great. It makes a ton. It would be a great potluck dish. It can be made ahead of time and frozen or refrigerated. I suggest dividing this into two 9-inch pans and freezing one of them for later. Each pan would serve about 6 people. This is good reheated for lunch or dinner the next day. Thank you so much for sharing your recipe with us Jennifer! Combine first 12 ingredients. Spread into a lightly greased 9x13-inch dish (or 2 9x9-inch dishes). Top with cheddar cheese and breadcrumbs. Bake uncovered for 45-60 minutes, until bubbly. Try it with crushed Ritz instead of bread crumbs. It gives a great flavor! How many cups is 12 oz spaghetti? Eileen - I am not sure how many cups it is. It is 3/4 of the pound package. Enjoy! I made this last night, and it was really good. I halved the recipe and made it in an 8x8 pan. The butter I had was salted, and the next time I make it I'll leave out the extra salt. Gawd this looks good. Pinned. i'm wondering can the spaghetti be switched out for a different pasta...and would that affect cook time?? Please forgive this ignorant question.....if i were to make this is 2 pans, when you say "freeze the other one", exactly, how is that done? just stick it in the pan, cover with foil and freeze? I put it in the pan, cover it with plastic wrap and then with foil and throw it in the freezer. Easy enough! Thanks for that! I thought there was way too much parsley and butter so I cut in half the amount. Also the time to cook I felt was to long since everything is already cooked. I cut the time in half as well. Everything turned out perfect! The family loved it! Thanks! After reading the recipe & all the comments I find the comments are very helpful. I always tweak recipes I see to my personal tastes, as I think a lot of people do. After reading your comment Jodi, I re-read the recipe, and I think you may be right for my taste. It does sound like a lot of butter and way too much dried parsley, however it may be fine if you used fresh parsley. This reminds me of a dish I make with chicken thighs,cream. of mushroom soup,sour cream and rice. I cook the chicken first with butter,garlic powder,Cavenders and Salad Supreme., then mix 1 to 1!/2 cups rice with soup,sour cream and a little milk. Bake for 45 minutes or until rice is cooked. I would make this recipe like you said , or use fresh parsley and cut butter in half. I think I would add a 1/2 cup of heavy cream or fill one empty soup can with half and half. I like my dishes extra creamy and I think if you were to freeze it, it would need extra liquid to keep from drying up. You could always add a little chicken broth when cooking it out of the freezer. I don't think people replying does any harm or insults the original poster of the recipe, I think all the ideas are helpful when you read a recipe and it has something you don't like but the rest sounds very good to you. 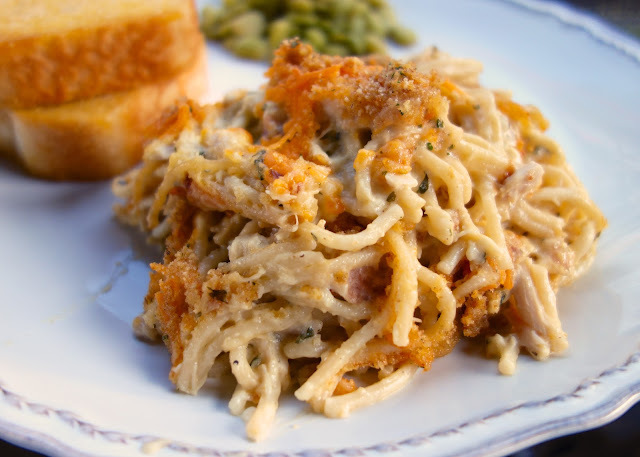 My mother made Turkey Tetrazzini a lot growing up and I love anything with pasta in it as long as it doesn't have bell peppers. I want to make this but only have 3 large CANS of chicken or a big pack of thigh/leg quarters and am too lazy to bone and skin them since I just did a whole one for chicken and rice. I wonder how canned chicken would taste? I'm sure not as good as a rotisserie one, but I have less than a dollar in my bank account and my whopping 15 dollars in food stamps for the month is gone on necessities and I still forgot the sourcream! Good to know, I thought a entire stick of butter sounded like a lot. I'll try it this way as well! I used cream cheese instead of sour cream. Great! Can this be made the day before and cooked the next night? I'm not sure if it will be as creamy and get a little dry. Your thoughts. Thank you! I used less parsley because I am not a big fan of dried parsley. I increased the Italian seasoning so it would still be flavorful. Also, I crushed Ritz crackers up to go on top instead of the Italian bread crumbs. Can't wait for it to come out of the oven!!! I used less parsley flakes because I am not a big fan of dried parsley. I increased the Italian seasoning so it would still be flavorful. I also used Ritz crackers instead of Italian bread crumbs on top. I can't wait for it to come out of the oven!!! To cut down on calories could I use plain yogurt instead of the sour cream? Love the idea of halfing this since there is only the 2 of us. To cut down on calories could I use plain yogurt in place of the sour cream? love the idea of halfing this dish since there is only the 2 of us. Delicious! Made this for family and everyone raved. Didn't change a thing. I'm a firm believer in trying the recipe as is the first time, then tweak if needed - no tweaking necessary here! I have made this several times and followed the directions exactly as written and it really was wonderful. The last time I doubled it for a large group. This time I will be making 3 batches for an even larger group! Funny thing though, I really thought this recipe had red pepper flakes in it previously?? I must be going crazy. LOL Thanks for a wonderful recipe. I am making this tonight but i am definately adding some onions!! and 1 can cream chicken soup, one mushroom, and adding fresh mushrooms as well! What temp do I bake this at!! I made this as recipe called for. IT WAS GREAT will put it in my menu planner once every mo.or 2. Hubby really liked it to. Hope it freezes well. Freezing leftovers. Made this for dinner last night. It was delicious. Put half of it unbaked in the freezer for another time. Had it for lunch today too! Winner! I microwaved the butter and forgot about it! Hopefully it turns out okay! It’s in the oven now.